Fiber optic technology is considered among the most reliable means of transmitting information. Weather conditions don't affect cables; connectivity is not interrupted by moisture, heat, or lightning. And, though fiber optic cable is more expensive than copper, overall costs of fiber optic installation, maintenance, and use are cheaper than other options. Maintenance is minimal, with costs decreasing over time. Transmission is faster. It's the speed of photons (light) versus the speed of electrons. 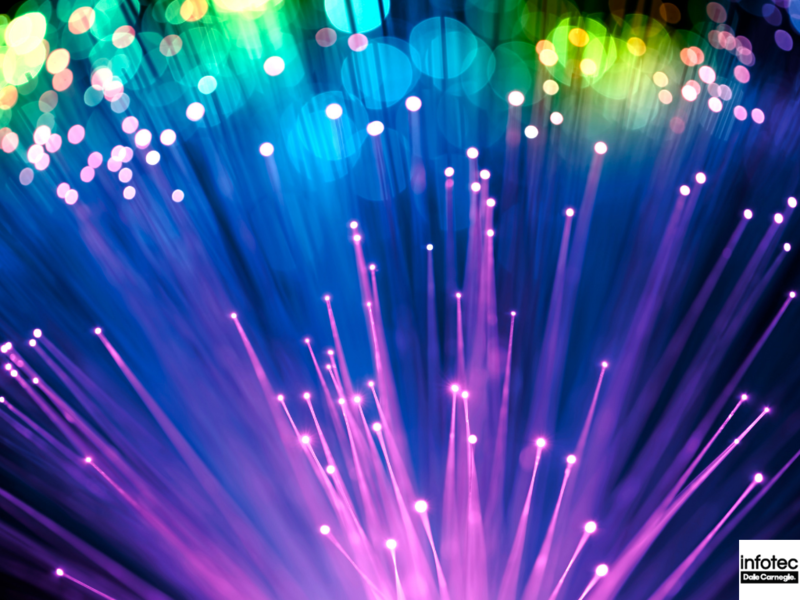 Fiber optic cables don't transmit data at the speed of light, but close -- about 31 percent slower. Less attenuation with fiber optics, meaning when traveling over a long distance, less signal is lost than with copper cables. Not a fire hazard. Fiber optic cable won't catch on fire. Impervious to electromagnetic interference (EMI). Copper wires, when improperly installed, can produce electromagnetic currents that sometimes interfere with other wires and can disrupt a network. Fiber optics don't conduct electricity, as copper cables do. Don't break as easily as copper, even though they are made of glass, don't need to be replaced as often. Why Train Employees in Fiber Optics? Military use includes facilitating mobile and field communications, including under water and air. Lasers, light guides, and imaging equipment is used by medical professionals. Many companies use fiber optic networks to connect their computers, smartphones, printers, and other devices used by employees daily. Firms involved in mining and exploration use fiber optics for remote viewing to collect atmospheric measurements for pressure and temperature. Internet service providers give subscribers fast, smooth, and reliable service through fiber optic cables. Cable TV providers use fiber optics to provide on-demand video and other digitally delivered services to homes. Furthermore, fiber optics technology is also used in security and many other data transmission applications. For employers involved in installation, maintenance or scaling of fiber optic networks, it's sometimes a challenge to find fully certified workers. A number of certifications exist, but an employer must choose which are the most beneficial for employees. It may be that no one certification is right for performance of all the tasks needed to meet industry standards. However, pursuing some of the certifications mentioned here may help your employees improve their abilities and help you meet contract demands. Certified Fiber Optics Installer (CFOI). Installers learn to install and troubleshoot fiber optic cable networks so they work efficiently. Installers must be competent to perform a combination of fibers, connectors, and splices on most commonly occurring problems. Military Installation Professional (MFOI). Certified Military Fiber Optics Installation Professionals are certified for skills in installation, testing, and troubleshooting of fiber optic systems in accordance with military standards. This certification focuses on the fiber optic technologies used by the military and government agencies that are affiliated with them. This certification covers the use of tactical fiber optic connector assemblies (TFOCA) and military standards for their deployment. Certified Fiber Optics Technicians (FOT). The FOT certification is for those who work at troubleshooting fiber optic cable networks. They are certified capable of troubleshooting different cable systems with a combination of fibers, connectors, and splices on common problems. Fiber Optics Designer (FOD). This certification validates knowledge of optical local area networks, with capability to design a successful fiber optic system with network protocols, optical cabling, network configurations, industry communication standards, hardware selection, determination of fiber count, splicing/termination methods, cable system testing, and documentation. Data Cabling Installer Certification (DCIC). DCIC certifies knowledge needed to install and troubleshoot voice and data outlets at work stations and in telecommunication rooms. Skills for those who are certified include cabling pathways and spaces, how to work with contractors, understanding the various types of cabling, and evaluating work and how projects are implemented. DCIC installers know how to repair, splice, and terminate cables or perform upgrades to existing networks. Connect with Infotec today to discuss the Fiber Optics Certifications that can help your team meet industry standards and improve outcomes for your company.